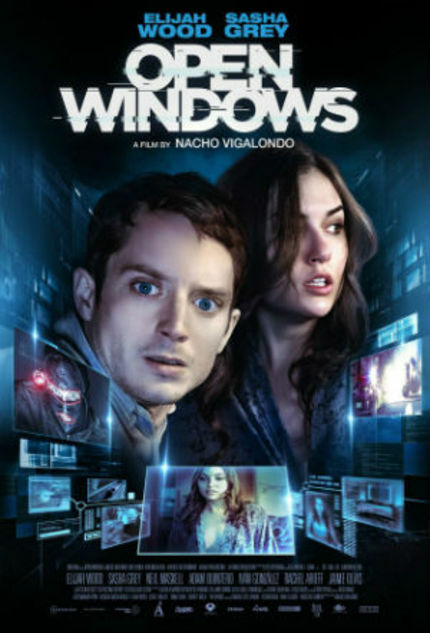 Early on in Open Windows, Spanish filmmaker Nacho Vigalondo invites easy comparisons to Alfred Hitchcock's Rear Window, but then, pardon the expression, he throws them out the window. What begins as an homage quickly morphs into a thriller with its own unique, wildly enjoyable, and altogether satisfying identity. The creatures who inhabit this cheeky cyber-sphere are the usual suspects found in techno-thrillers. Nick Chambers (Elijah Wood) is the perfect patsy, an innocent citizen caught up in events that spiral out of control in a heartbeat. Jill Goddard (Sasha Grey) is the 21st-century version of Grace Kelley, a glamorous actress with an exploitable personal life. She is also easily-positioned as Nick's imaginary girlfriend, though he would never dare to say that out loud. He worships her from afar, creating a fan site to track every move in her career. The villain is a voice on the phone / computer, alternately wheedling and commanding as he pulls the strings. They come together when Jill makes an appearance at a fan convention in Austin, Texas. Nick believes he has won a contest to meet her, and is waiting patiently in a hotel room when he is contacted by the villain, known as Chord (Neil Maskell). Before he can blink, Nick is sucked up into a dark world of computer hacking, surveillance cameras, blackmail, flimsy robes, black leather, sharp knives, and a form of terrorism that becomes very personal. Vigalondo, returning to the type of breathless, twisting narrative he mined so well in his feature directorial debut, 2007's Timecrimes, uses Hitchcock as a starting point, blending genre influences and nicking moments of inspiration from other master filmmakers. Open Windows is presented from a dizzying array of computers, cameras, and cell phones, but what might seem like a gimmick is smoothly subsumed into the storytelling. The emphasis is placed squarely on what is happening to the characters, not the means by which they are observed, even with the POV darting between multiple sources. The technology that is utilized flows easily into the river of imagery; it serves a purpose that is integral to the film. As Nick, Elijah Wood is a believably panicked, and most unwilling, accomplice to the crimes that are committed. Nick is an appreciative fan, not a creepy stalker; he may be obsessed with Jill, but is sufficiently mature and self-aware to know he's always in danger of slipping into the sleazy shadows of fan worship. Sasha Grey is effective in her role, which calls for a variety of frightened expressions. Neil Maskell lends what could be a stereotypical 'villainous voice with a British accent' an additional degree of complexity and nuance. Adam Quintero contributes a good turn as a computer hacker. Somewhat similar to Cary Grant in North by Northwest, forcibly inebriated and careening down a mountain road toward certain death, Open Windows zooms along as though it's out of control, dashing from here to there in a heedless race to the closing credits. But Nacho Vigalondo is not drunk at the helm, and his film only appears to be out of control. Open Windows thrills and chills, and then roars across the finish line with the checkered flag waving in victory. Review originally published during SXSW in March 2014. The film opens in select theaters in the U.S. on Friday, November 7. It is also available to watch via various Video On Demand platforms. "This CD is mine. The band is called Suicide and they are awesome!" *Facepalm* This movie was really bad. Twitch what happened to you? You used to be good. My hunch is what happened is that Peter liked it. And so did Shelagh. Other people didn't. Sometimes that happens.